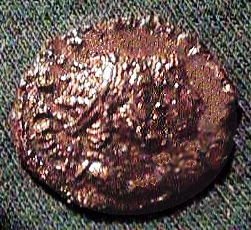 Gaius Pius Esuvius Tetricus was the last of the Gallo-Roman Emperors. Tetricus was Governor of Aquitama and had been a Senator from an old noble family. 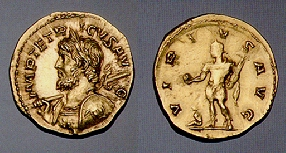 Following the death of Victorinus, Tetricus, through the influence of Victoria, the mother of Victorinus, was proclaimed Emperor. Almost immediately, he raised his son, Tetricus II, to the rank of Caesar. The Gallo-Roman Empire was in serious trouble. It faced constant difficulties with the barbarians along the Rhine. To make matters worse, Aurelian came to power in Rome and he was determined to retake the Gallo-Roman Empire and restore the glory of the past. The fortunes of the Gallo-Roman Empire declined rapidly under Tetricus. The final blow came in 273 AD when Aurelian invaded Gaul itself. Tetricus, fearing for his life, abdicated and surrendered. Aurelian spared the lives of both Tetricus and his son, and even gave Tetricus a post in the government of Italy. The ex-Emperor spent the rest of his life in Rome, honored by Aurelian and his successors while his son became a Senator.